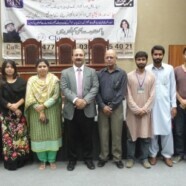 On 11 October 2013, the Formanites’ Education Society organized a Career Counseling Awareness Workshop for Intermediate students. Mr Musa Kazim and Mrs Shazia Agha, CIN Education Advisors were invited to speak. The basic purpose of workshop was to guide the Intermediate students about getting admission in foreign countries like Turkey, Malaysia and China for higher education, especially for the pre-medical and pre-engineering students. Students came to attend this workshop and they showed a lot of interest and asked different questions. In the end students asked to organize more educational workshops.